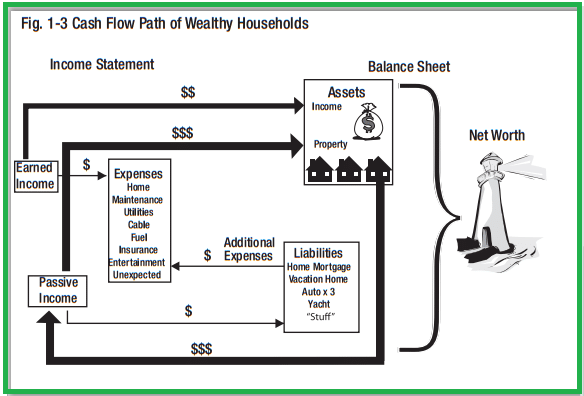 Understand Household Cash Flow to Build Wealth? 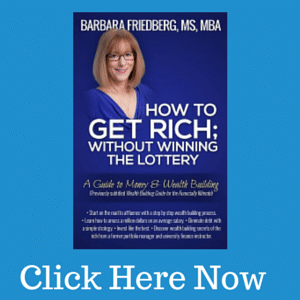 Are you ready to start building wealth, rather than just making a living? Consider what you’re doing with your cash flow. Building wealth and achieving financial independence is like losing weight or quitting smoking. It is simple, but not easy. By understanding what to do with your cash flow, you can increase your net worth. 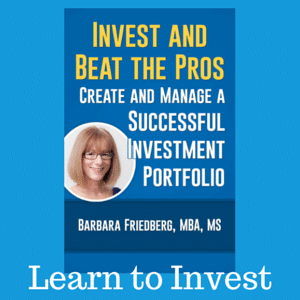 Understand the difference between true assets and real liabilities and put your money into the assets. Learn about and anticipate the coming demographic changes and their implications, because demography is destiny. 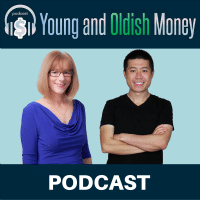 That is correct – your home mortgage is actually a true liability to you because it takes money out of your pocket monthly and it is a real asset to the bank because it is the bank’s monthly income stream. The house you rent to someone else is your asset. The house you live in is your liability. This concept became a painfully reality to many in 2008. Everyone has expenses. 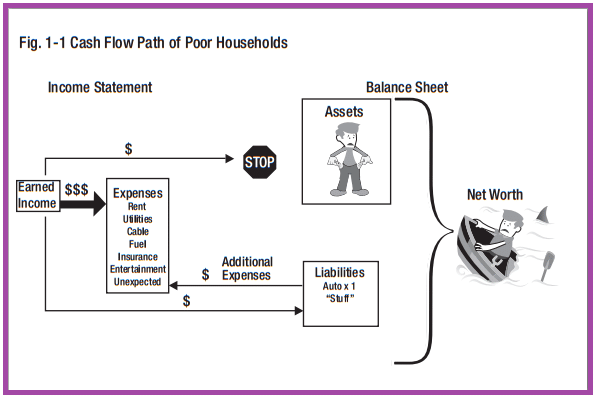 What characterizes poor households is that almost all of their earned income flows into the Expense Box (Fig. 1). They struggle just to maintain a roof over their heads, food on the table, and a car in the driveway. They have just a little money to put into their Liability Box and no money for the Asset Box. 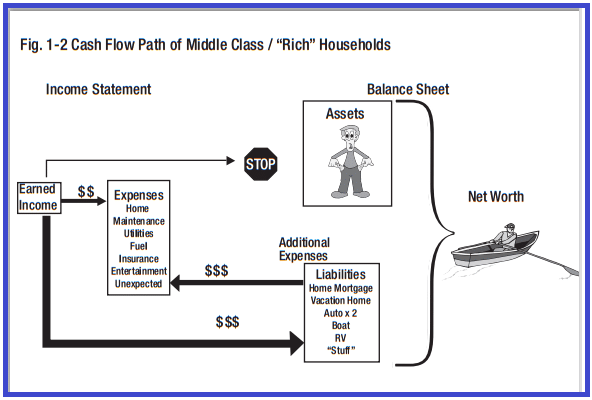 Rich and middle class households share similar cash flow patterns. Again, everyone has the basic living expenses in the Expense Box, and the middle class and rich households have proportionately higher living expenses than the poor households. Rich people are often the successful professionals in the community and are characterized as having high earned incomes, but usually they also have expensive lifestyles with a lot of “stuff” in their Liability Box. Although they are high earners, often, they too live paycheck to paycheck. Most of their cash flows from the Earned Income Box down to the Liability Box (Fig. 2). But the defining characteristic is the huge amount of “stuff” in the Liability Box, which drains a disproportionately high percentage of the earned income to both buy and support those liabilities. The second characteristic that you will notice is that, much like the poor households, neither the middle class nor the rich have money flowing into the Asset Box to generate passive income. This is a tragic domestic cash flow. Unlike the poor, the middle class and rich do have options available to them, but every time they pull out their credit card or checkbook they just keep choosing the wrong options…they choose to put their earned money into liabilities instead of assets. As shown in Fig. 3, the wealthy households have an Asset Box and you now see a flow of earned income into the Asset Box. So not only do wealthy households have more money flowing out of the Earned Income Box, but, more importantly, they now have additional, passive income being generated in the Asset Box. Although they have more “stuff” in their Liability Box, the wealthy use their passive income rather than their earned income to support these liabilities. Unlike the poor, middle class or rich, the wealthy households have income generators in the Asset Box which generate passive income that can now support the living expenses, the Liability Box and, most importantly, flow back into the Asset Box to buy new income-generating assets to continuously build wealth. What separates the wealthy from the poor, middle class and rich is this automatic feedback loop between the Asset Box and the Passive Income Box. At some level this feedback loop becomes self-sustaining, the Earned Income Box become unnecessary, and the household truly achieves financially freedom. “Rich” is being on a financial treadmill. “Wealthy” is having financial freedom. Your tenant’s rent should be covering the utilities, property taxes and insurance, along with paying down the mortgage; leaving you with money left over to put toward your next income producing asset. Economical, affordable, work force housing located in a safe area with a good school system and employment opportunities will allow you to have an investment where you can responsibly leverage your money and maintain both custody and control over the money you have worked hard to accumulate. Soon your Liability Box will be shrinking, your Asset Box will be growing and you will be building wealth and on the road to financial freedom. Remember, it is never too late to start to build wealth. Harland “Colonel” Sanders was age 65, broke and collecting Social Security when he loaded pressure cookers and his secret recipe into his car and went on the road to start Kentucky Fried Chicken. Stanley A. Riggs, MD, author, Build Wealth & Spend It All. Dr. Riggs received his Bachelor of Science degree from the University of New Hampshire, his MD degree from Dartmouth Medical School, and completed his orthopedic surgery residency at the Mayo Clinic in Rochester, MN. While establishing and managing his private practice in Florida, he developed and managed his own commercial real estate portfolio. With his self-taught knowledge of real assets vs. liabilities, economic cycles and demographics; he was able to build successful careers in the residential, commercial, industrial and resort asset classes by anticipating and staying ahead of the national economic trends. Dr. Riggs resides in Sarasota, FL.